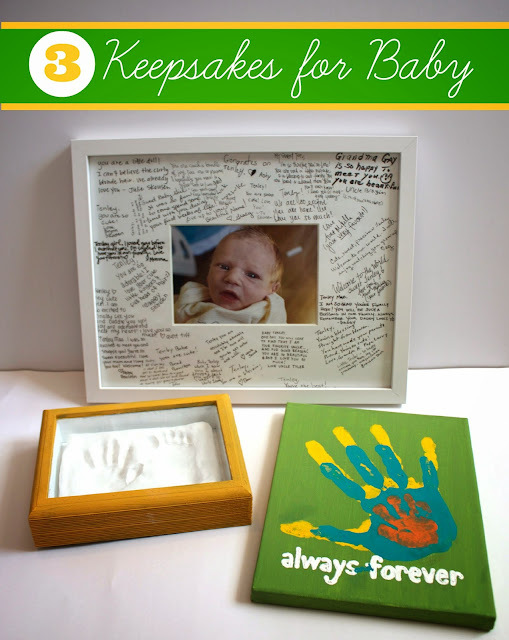 The Sunshine Space: Keepsakes for baby. Today is October 12th. The due date of my first baby was October 11th (10-11-12!) of last year. I remember this day a year ago: I was anxious. I was a bit frustrated. I felt HUGE. I was ready, but also grateful to have a few more days to myself. I had no idea what to expect. I was worried I wouldn't know when I was in labor. I had so much on my mind. . . It's crazy that my baby girl turns ONE next week. A whole year. As you can imagine, I've been a little nostalgic as her birthday approaches. I love thinking about and remembering our time together so far! It's so important to me to record her life. Of course, I'm a big fan of scrapbooking and journaling, but I like to document her story in other ways too. I thought I'd share three special keepsakes from her first year of life as part of her b-day celebration. Project 1: Memory frame. Super easy. Buy a picture frame with a big white mat (I got mine at Target). Buy an acid-free black pen. 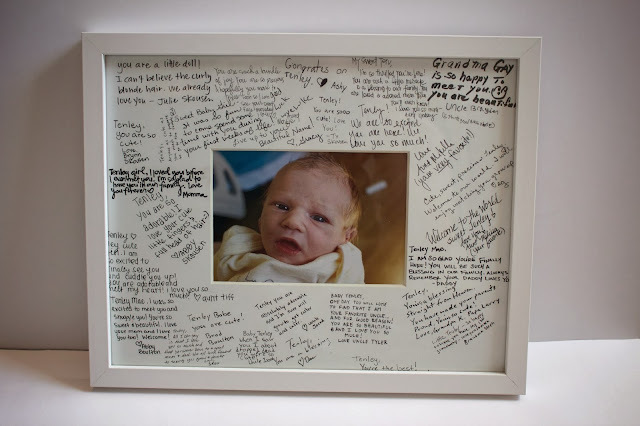 Have visitors write messages to baby when they come to visit after the birth. I love the sweet messages our loved ones wrote to Tenley. This frame hangs above her dresser in the nursery and it's so nice to see these words and remember the moments from her very first days of life. 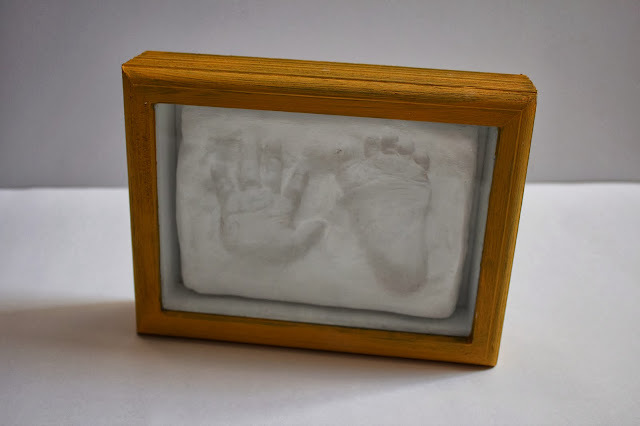 Buy a shadow box frame and some modeling clay. Form a rectangle out of the clay that'll fit in the frame. Press baby's hand and foot in the clay. Paint clay with white acrylic paint. Hot glue the rectangle of clay to the back piece of the frame. Tape off the glass in the frame from the inside and the outside. Paint the inner surfaces of the frame white. I love having this precious project on display in our home. Her little hands and feet have already grown so much. . . so it's cool to have them "set in stone." This shadow box also adds depth and dimension to one of our frame walls. 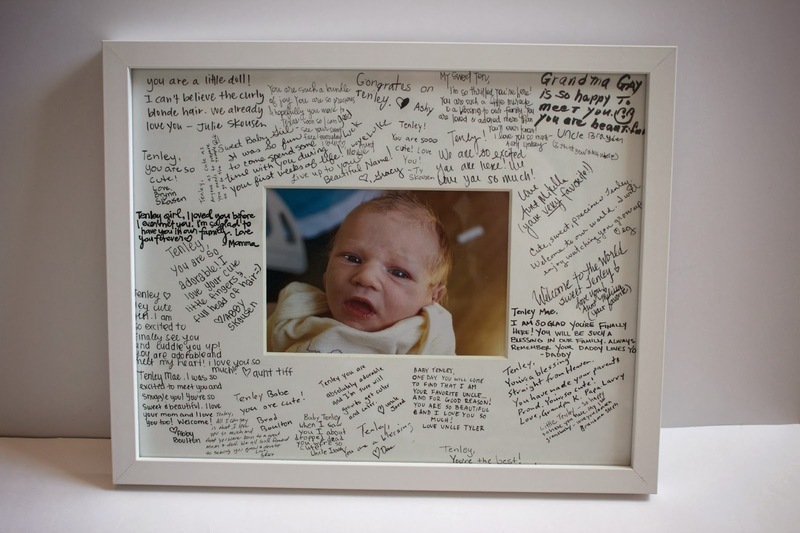 Keepsake and home decor: win, win! Buy a small canvas and some acrylic paint in various colors. Pick a paint color for each member of your family. 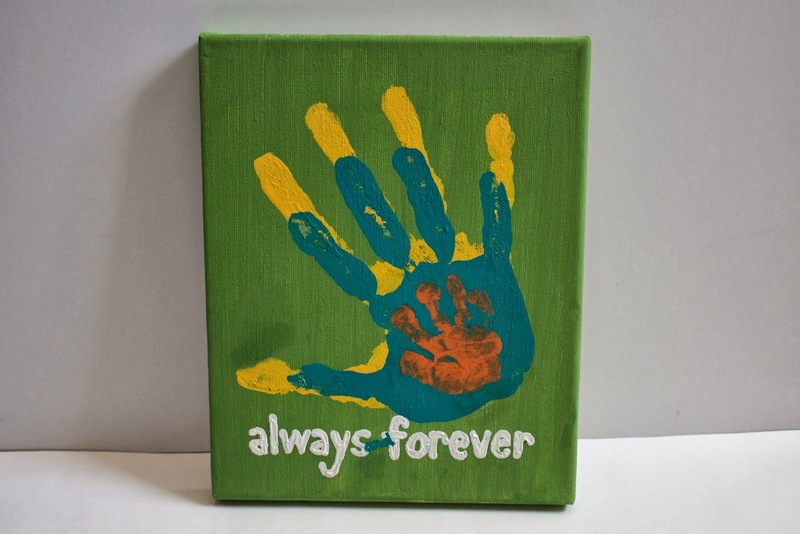 Paint the palm of the person with the largest hand first. Press to canvas and let the paint dry. Repeat previous step for each family member. Fix hand prints with extra paint if there are patches of space that didn't quite get filled in on the canvas. Paint a message at the bottom, if you choose. Don't forget to date your keepsakes on the back! I learned to date things from my grandma, EG. She has a good habit of dating all her pictures and cards.